On last Tuesday, Saint Leo University President Arthur F. Kirk, Jr., joined by Mary Jane Crouch, executive director, America’s Second Harvest of Coastal GA; Mary Ellen Sprague, alderwoman; Mickey Stephens, Georgia state representative; and many other community supporters and local leaders held the ribbon cutting of Saint Leo University’s new facility. Saint Leo is a leader in providing educational opportunities to adult learners, in classrooms and online, and is poised now to serve more students. Attendees toured the classrooms and meet the educators. The community is one of Saint Leo’s six core values. Community, along with respect, personal development, excellence, responsible stewardship, and integrity, comprise the values that guide and enrich a Saint Leo University education. 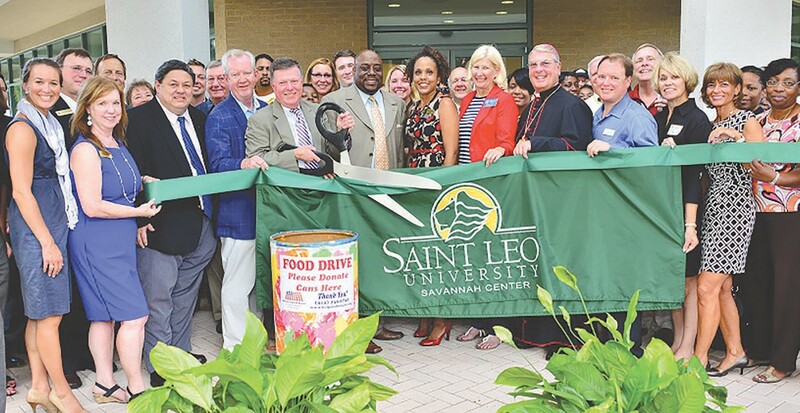 Saint Leo University has been in Savannah since the 1970s and is celebrating its 40th anniversary of educating members of the military, veterans, and their families. The Saint Leo Master of Arts in theology program has been selected to help prepare Catholic men to become deacons.